My daughter started piano lessons this past week which is exciting to me for several reasons and one of those reasons is that I get to make her a new bag for her piano books. 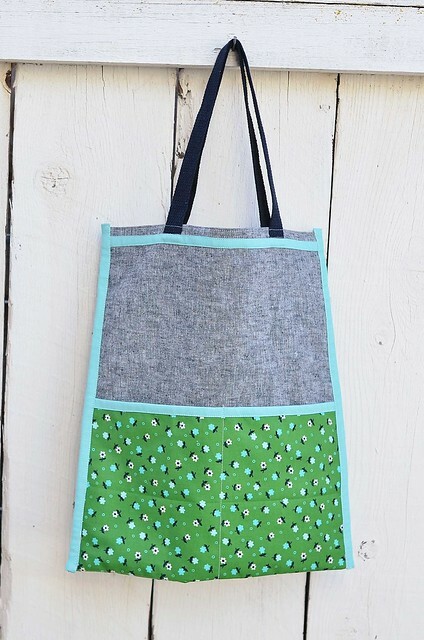 Not that we don't already have half a dozen handmade tote bags sitting around the house. So last night at around 2am when I was up with the baby who is a little congested and is not dealing with it very well, I took advantage of the quiet house and put the baby in his bassinet in my sewing room. I used the Inside Out Bag tutorial on the Purl Bee and I am very pleased with the result. It was quick, easy, and different from anything I have ever made. Painfully I used one of my absolute favorite prints for the pockets. It is from Cotton and Steel's Cookie Book collection and it is just the right amount of girly without being pink (my daughter is not into pink these days, but this print does also actually come in pink). The body of the bag is yarn dyed Essex linen in black (available here) and the bias tape (which I did not cut on the bias) is Essex linen in aqua (available here). I did find that the larger pocket gaped a little too much, so I added a small piece of velcro after the bag was finished. 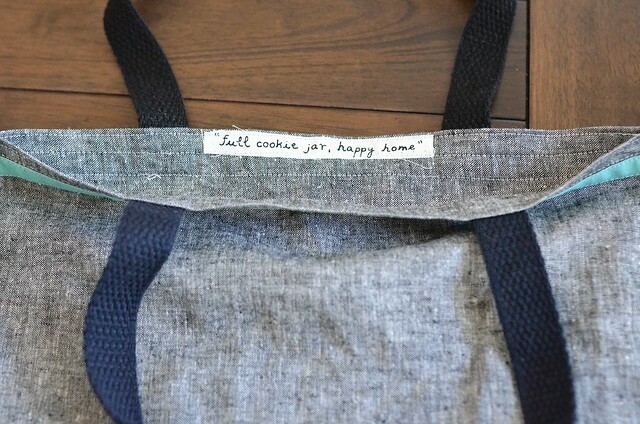 The Cookie Book print had this adorable (and accurate) quote on the selvage which I added it to the interior of the bag. And if you take a close look at the photo above you might notice something that I didn't notice when I was making it at 2am: one of the handles is black and one is navy blue. I was so pleased that I had enough cotton webbing on hand for the handles, but in the poor lighting conditions I thought they were both black. Oops. Maybe I can pretend I did it on purpose. What a sweet bag, complete with mismatched handles. I'm an avid bag maker, and this is a pattern I'll have to check out. 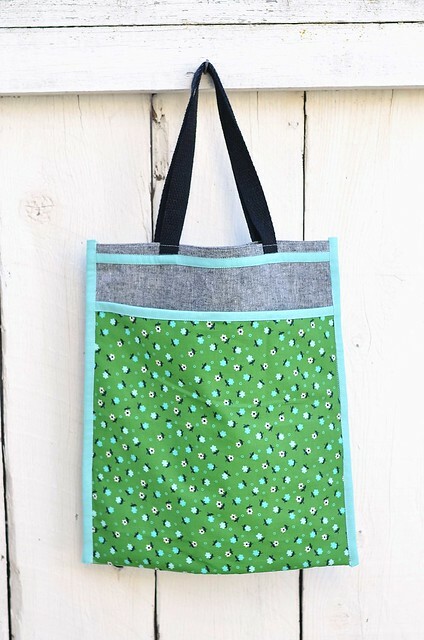 It doesn't matter how many homemade totes you have lurking in closets and under beds, you can always use more! This is such a lovely finish. Kids now days often wear mismatched socks on purpose. Think of the handles as starting a new trend! That's so cute...like putting socks on in the dark! Yes, a creative design element! Great bag and so fun to start a new year with a new bag. I love your black and blue handles!! :-) It reminds me of the day my husband came out of church and said he had to go home. I asked why, and he showed me his penny loafers: one black and one brown! :-) Now he checks more carefully when he puts them on!